Please share this event on Facebook using the LIKE button above. Philly's Largest & Most Popular Oktoberfest Celebration!!! LAST YEAR SOLD OUT TO OVER 8,500 PEOPLE! BUY TICKETS NOW!!!!! Voted one of the top-10 Oktoberfest parties in the country by Draft Magazine, we proudly announce the 6th Annual Oktoberfest Live! craft beer festival celebration at the incredible XFINITY Live! Philadelphia. EVEN MORE EVENT AREAS THIS YEAR - massive expanded beer garden & party area and room for over 15,000 people - what does this mean to you? Plenty of space and no long lines on one of the largest Oktoberfest events on the east coast! This festival comes complete with indoor, outdoor, and covered beer gardens, German Oktoberfest-style beer tents, 7 spectacular areas, food trucks, multiple musical acts, and MUCH MORE! Grab some friends and come on out for a beautiful fall day of amazing beer-drinking fun. FULL DETAILS are below under "What can I Expect" - an absolutely amazing line up of beers & fun! Listen to live bands all day with unlimited sampling of 250+ great craft beers from 125+ breweries (yes, many awesome German & Fall / Oktoberfest brews will be included) in your own custom stein while enjoying live music all day long. You'll also have access to access to Victory Beer Hall and 6 other specialty areas. Entertainment will include live DJs inside, multiple bands including authentic German music, super-fun contests, tons of bartenders & serving spots, games, activities, prizes, and giveaways. PLUS (if you can believe it) MORE! Want to SPONSOR or VENDOR at this event? Click "Contact Event Organizer" above. See below on how to be crowned "Mr. or Mrs. Oktoberfest Live" winning an amazing VIP experience! These tickets include unlimited beer samples - General Admission and X-treme VIP (see below for added value). Please use the "Contact Event Organizer" link if you have any questions. PLEASE NOTE, ticket prices are subject to increase closer to the event. BEST VALUE! Includes everything listed in General Admission plus exclusive access to multiple private VIP areas, private inside bathrooms, multiple VIP-only beers to taste all day long, complimentary bottled water & soft pretzels, and 1-hour early entry (VIP area opens at 2pm with unlimited samples). NOTE: VIPs can mingle with General Admission guests outside of the VIP area. Yeah, it's awesome being an X-treme VIP!!! Includes access to 6 different event areas (no access to VIP area) with unlimited beer samples in a custom beer stein, live music, multiple DJs, tournaments, games, and access to the after party with more late night live music! Unlimited beer samples start at 3pm for Gen Admission. Includes access to all areas (just like VIP) with no beer samples included of any kind. Soft drinks are included. Please Note that with a Designated Driver ticket, you are not allowed to purchase any alcoholic drinks from the bar due to PLCB regulations. What to Expect at Oktoberfest Live! Past Event - Oktoberfest LIVE! 2016 - What a Day! Past Event - Summerfest LIVE! 2016 - What a Day! Past Event - Springfest LIVE! 2016 - What a Day! 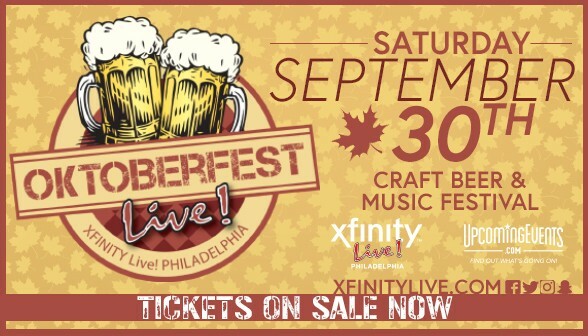 You should be getting exhilarated for Philadelphia's most exciting beer festival and its hottest location, XFINITY Live!. Celebrate and hold up a stein to cheers with friends at this exclusive and official Philly Oktoberfest party! Typically get bored after a couple hours at a beer fest? Your wish has been granted. Here are a few things that we have in store for everything to participate in. We are rain or shine and have the entire inside area plus outdoor tents for up to 2,500 people! Please note that this event is 21+ only, proper ID required. FREE PARKING! Enter off broad street A Gate to park in the Wells Fargo lots and show your event ticket. Don't want to drive? Take the TRAIN and walk to XFINITY Live! (Broad St line runs 24 hours now on Friday & Saturday!)! Get $50 in credits toward your first LYFT rides with promo code EVENTS. Yes, $50!!!!! First-time sign ups only. Amazing Deal! Hotel Room special - walk to the event and stay over. Group Code: OXL Holiday Inn (book online or call 215-755-9500). LIMITED ROOMS AVAILABLE!!!! Live outside of the Philadelphia area? Take Amtrak, save $ on tickets! 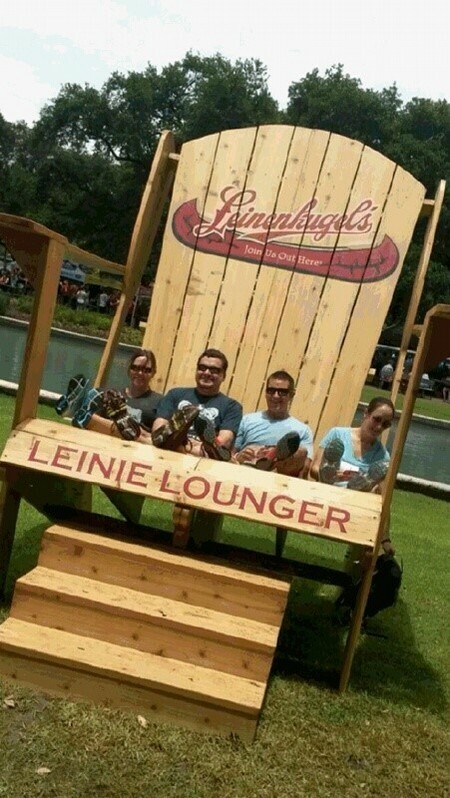 Take a load off and get your photo taken in the Giant 'Leinie Lounger' Chair! Listen to live indoor & outdoor music or bounce to the DJ or get funky in Victory Beer Hall! Victory Beer Hall - Local PA beers, live band, contests, and amazing beer drinking! PBR Bar & Grill - Craft beer & Bull Riding with the World Famous Buckle Bunnies inside PBR Bar & Grill! Broad St. Bullies Pub - featuring craft beers from all 4 seasons! DJ entertainment. Wander down Food Truck Alley with lots of great options for purchase!! TONS of serving stations with signs for all beers - sip 'n go! Rain or shine event - please dress for the elements! Want to SPONSOR this event? Click "Contact Event Organizer" above. Want to have your truck at this event? Contact the event organizer above!